kalmstrom.com Business Solutions has begun using HTML5 techniques in dialogs and forms, and we are very pleased with the results so far. HTML is a code language that most people connect with websites, but it can also be used for other purposes. It is widely known among IT professionals, and therefore we have used it in the Folder HelpDesk ticket form. That way administrators of this issue tracking tool for Outlook can customize the ticket form rather easily. However, version 5 of HTML is something more. The latest version of HTML gives enhanced support for multimedia and can deliver animation, music and movies. It can also be read by many different computers and devices. But the most important for the kalmstrom.com development is that HTML5 can be used to build complicated solutions that run in a browser. Therefore HTML5 seems to be very suitable for forms and dialogs in the kalmstrom.com solutions. We have recently published a major update of TimeCard, the kalmstrom.com time reporting tool for the Outlook calendar. When we rebuilt the user interface we made use of HTML5 techniques. We are pleased with the way it looks, and so are the users who have upgraded. Below is the main screen of the TimeCard Single settings. Another advantage is that we will be able to re-use a lot of the code in the upcoming new TimeCard product, TimeCard for SharePoint. In addition to the technical benefits, the usability is very good, with quick, responsive controls. Following the TimeCard success, we have now decided to rebuild Calendar Browser using the same HTML5 techniques. Most organizations have a number of resources that need to be booked in advance. It may be rooms, cars, equipment or even people. In Calendar Browser each such resource has its own calendar, and you book the resource by making an appointment in the calendar - something that most people know how to do! 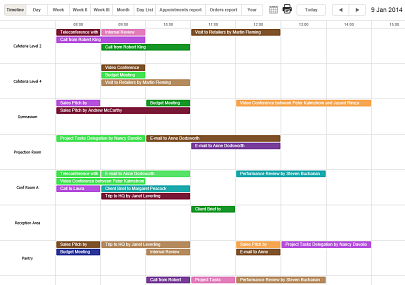 Calendar Browser has an overview, where you can see the already booked resources displayed in various ways. You can also book free time periods directly in the overview. Here the HTML5 techniques will be especially useful. With HTML5 we can make the Calendar Browser overview much quicker to load and more informative, and it will also be a major building block when we start developing Calendar Browser for SharePoint. The image above shows the first build of the new overview. The kalmstrom.com developers are always keen on trying something new, and doing so is part of the job for all of us. Sometimes we have to discard the news as not useful to us, but in HTML5 we have found techniques that will enhance the kalmstrom.com solutions during the new year.